The Beatles made their debut on the television show ‘Val Parnell’s Sunday Night At The London Palladium’ on Sunday 13th October 1963. Three months later they made their return. ‘London Palladium’ is based on those performances. 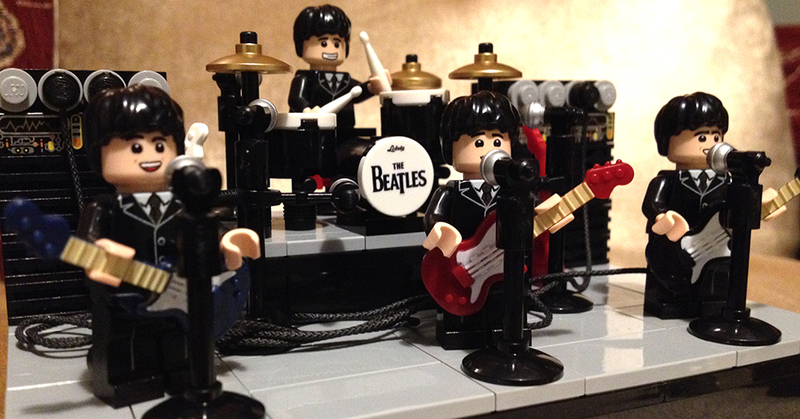 I gave The Beatles matching hair, added guitars made by Brickforge.com and Lego string with end studs for the ‘electric cables’ looped across the stage. The amplifiers were adapted from designs by Firestartoys.com. Ringo’s drums were copied from his Ludwig setup, the drum skin was custom printed by Minifigs.me and the ‘plug’ for the bass drum was made by customising a Lego Technic pin. The stage, swivel stool, guitar stands and microphones were designed by me using standard Lego pieces. These models were created by Alan Green and the figures were designed and made by Minifigs.me.